Curry in a hurry is what this Easy Swordfish Tomato Curry is! Creamy, flavorful and oh so hearty, this Swordfish Tomato Curry was a joy to feast on. And, it is so easy to make! Check out the recipe and start currying, y’all! When it comes to food styling and photography, I have so much to learn. I’m coming up on my 5 year blogiversary in a few months, and I have just recently started dipping my toes into the sea of Youtube videos on shutter speed, aperture and ISO (which I used to confuse with SEO for the longest time). I know, I know. Crazy-right?!! Yes, most of the pictures you see on here have been shot in auto mode under artificial lighting. Food styling and photography are very different to what I used to do as a 9-5 graphic designer. Back then, there was more attention to angling than styling while photographing construction sites or lawyers offices that would be placed in their printed advertisements. Lighting hardly was an issue and I could spend hours on editing without any distractions. While learning to shoot food photographs in manual mode in hard for me, editing them is even harder. Now, I’ve worked with just about every version of Photoshop over the past 20 years or so, but, trying to edit food photos is a different ball game for me. You see, food photos trigger memories. Great memories of how much I enjoyed feasting on what I am editing. Then, indubitably, I need a snack break. 5 photos and a snack break. Another five… and… you get the picture! I only have 3 pictures of this Easy Swordfish Tomato Curry because I just couldn’t stop thinking about how good this was I bypassed all the process shots – which I know makes Google happy. My daughter and I enjoyed this Easy Swordfish Tomato Curry along with a variation of this Spinach and Lentil Stew, a Beet Onion Relish (recipe coming up soon) and these delicious Coconut Roti. This simple meal so hit the spot! Last night while I was editing these photos that I took almost a month ago, my daughter suggested she had a solution for my almost unstoppable need for snacking. She insisted I watch the first episode of The Santa Clarita Diet. Have y’all caught this Dexter-like, adorable-twist-to-a-horror-type show? If you happen to have liked Dexter (like I did) then, this show is worth checking out – just make sure you are not eating while you are watching it. But… seeing this is a food blog, I should probably be focusing more on shows that make ya hungry than those that zap your appetite… so… I’ll just go back to talking about this Easy Swordfish Tomato Curry. This curry, much like a lot of the Sri Lankan curries I grew up eating, is heavily coconut milk based. I put my fusion twist on it by making sure that I picked up every one of the ingredients from my local grocery store. If a recipe calls for an ingredient that cannot be found at Walmart or Kroger or Sprouts or any of the other mainstream stores I frequent, then I make it a point not to use it. 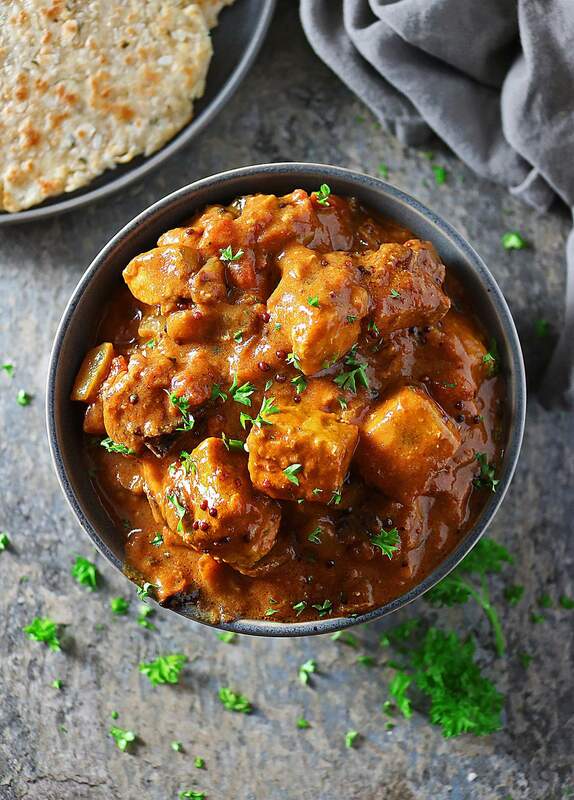 Tomato paste and a can of fire roasted tomatoes balanced off the sweet caramelized onions and zesty ginger so well and added so much of a flavor punch to this curry along with some garlic, coriander, cumin and turmeric. I like my curries hot and spicy so I added in some chili powder but if you are not a fan of the burn, please feel free to leave it out. This Easy Swordfish Tomato Curry can be also enjoyed on a bed of rice with a side of this Charred Zucchini Salad as well. Happy Monday y’all – I’m off to learning and practicing on taking decent manual food pictures in the first place with the least amount of editing and snack breaking… hoping your week is off to a fantastically tasty start! 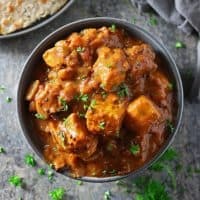 Curry in a hurry is what this Easy Swordfish Tomato Curry is! Creamy, flavorful and oh so hearty, this Swordfish Tomato Curry was a joy to feast on. And, it is so easy to make! 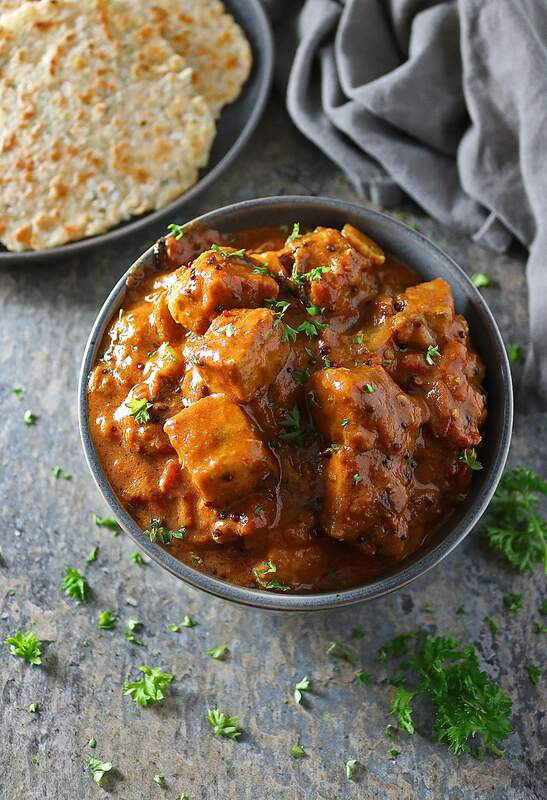 Check out the recipe and start currying, y'all! Add olive oil to a pan over medium heat and add in the onions. Saute onions about 20 minutes, stirring often. Add in the swordfish and stir for a couple of minutes. Then add in the ginger, garlic, coriander, cumin, chili powder, turmeric, coconut milk, fire roasted tomatoes and tomato paste, stir well so swordfish pieces are well coated and let simmer about 10 more minutes. Enjoy warm with roti or rice! Leftovers lasted us for about 2 more nights - we just reheated in the microwave as needed. Hoping y'all enjoy this recipe. I love curries. Even better is a recipe that makes enough to be reheated for a couple of more meals! I’m not a swordfish eater, but this recipe makes me think that I absolutely need to try it again… using this recipe. The curry looks so good! That curry gravy is definitely a keeper! What artificial lighting are you using? The pictures are great..I thought it was natural lighting. 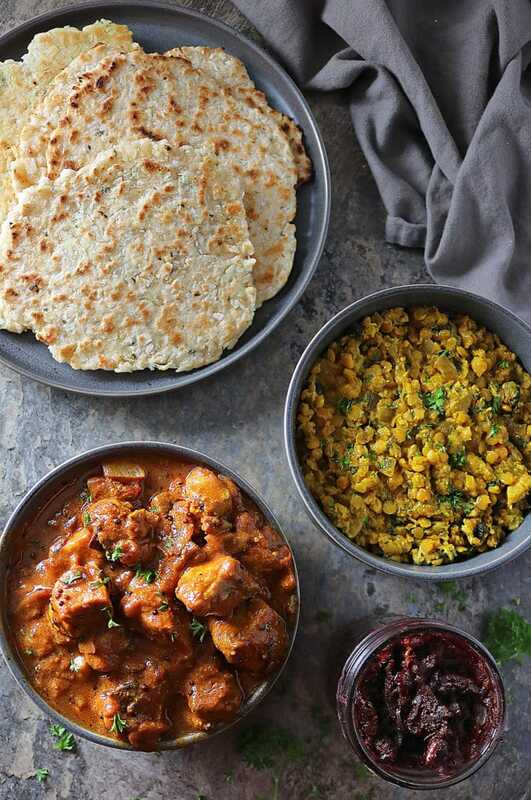 Oh, how do i love curries. This recipe looks very tasty! It’s perfect for me and my family. Thank you for sharing this great recipe. Pinned for later! Happy almost blogiversary! I also love lots of coconut milk and my curries very spicy. The swordfish and spices make for the perfect meal. So simple and flavor packed. Looks comforting. And I love those flat breads also. I think its made with rice? So I’ve got to say that your photos are amazing, Shashi! All of those YouTube videos have paid off. 🙂 I get it, though. I didn’t know the first thing about cameras when I started down this journey called food blogging. And there’s still so much more to learn. I get the whole need for a snack while editing pictures thing, too. Haha! So I went to google that Netflix show and that led me to 10 minutes of watching YouTube videos with Nathan Fillion…I’m a huge fan of Dr. Horrible’s Sing Along Blog! Gotta love the rabbit hole that is the internet right? Anyways, I could definitely go for some of this curry in a hurry! Love how you used swordfish here…I haven’t cooked swordfish in years! The color of the curry is so rich and I love coconut based fish curries. Saving this to try.